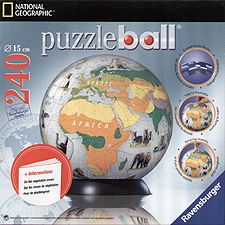 3D National Geographic Puzzle Ball. 240 pieces and display holder. Perfectly crafted plastic puzzle pieces allow for an exact fit and are created to easily fit together to form a solid, smooth ball - without requiring any glue! The result: a novel, decorative object. A Ravensburger innovation for puzzlers.